One wonders why this was not picked up before by our supposedly vigilant media, but yes the Queensland boys in blue have been fudging random breath testing results for some time now according to the Brisbane Courier Mail and I can quite well believe it. The comments made on this article were just what I expected I’ll reprint a couple. Their own Police union has been encouraging them to do this to (so say) meet impossible targets, who are they kidding, what a load of rot. Their commission to uncover this unsavoury affair has been further hindered as this would lead to more rubbery figures well I can believe that. I can also see why it is happening, the officers concerned could be on their way to a genuine distress call or robbery in motion but no to appease this government, they have to do this first make no bones about it. Money again of course it all boils down to cash which means that the Queensland Police Service is unpaid revenuers. 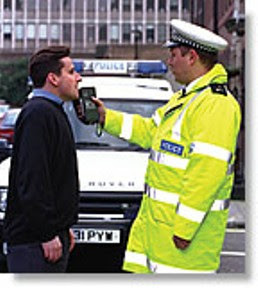 I must admit since living here in Queensland I have only been breathalysed once and that was because I was supposedly speeding. One comment said well don’t drink and drive, an idiotic comment it is a random one so anyone can be pulled over for this. Another comment was downright bloody stupid I quote If people didn't drink and drive, there would be no reason for RBTs. It is all in our hands Posted by: Ronaldo of Clontarf Beach 4:37pm today. Police Commissioner Bob Atkinson said he admitted police did not have the resources to fully investigate the fake tests but denied the practice was widespread. "No one to my knowledge has put up their hand and admitted they fudged the tests," he said. "To conduct an extensive investigation into each RBT return would tie up a huge amount of resources for a long period of time." Of course there are reasons; people break the law every day. I think most of us have bent the law in our lives; this does not condone DUI as I don’t condone it. But the Queensland government wants to get its house in order real quick as at the moment things are crook in this lovely sunshine state of ours. You are not doing so good as Premier Anna are you and it seems your erstwhile boss Peter is well out of it leaving you with the buck to pass as the 37th premier of our state. Sadly I seem to be finding it harder to blog these days. I guess I have too many things to do at this time, what with StumbleUpon and social networking; no not my space I hate them, my favourite is an Aussie one and to a lesser degree Facebook. Facebook in my opinion is not as good as I once thought, my grievances on there are mainly all the stupid applications. Facebook is not just content with that it wants you to pass them on to all your friends on it, I won’t be in that, I notice a lot of others have the same attitude as me, good on yah peoples. Trouble is friends cannot recall that I use it although I do remind them at various times. His internet connection is woefully slow, mainly cuz he is too mean to pay more, and yet he can afford it, at times his manner amazes me. So whilst he is away in Western Australia enjoying himself I decided to drive home I can’t wait to see his face when I present him with the Petrol bill, roll on Monday morning when I shall be out of there for good (I left the bill on his keyboard) oh no food there again as usual but he actually deposited a sum of cash in my account, enough to buy four takeout meals if I am prudent this could stretch to five, I wonder what he will have for his evening meal tonight! The best he usually does.